> You will notice you have not seen your girlfriend for a long time. The men and women have separated. The men are trying to see how much alcohol you can drink before dying, and the women are interrogating your girlfriend about marriage plans. Go find her. Stumble into the room, sit down next to grandma, put your arm around her, and start acting like you have confused her with your girlfriend. This will either be met with laughter and the grandma will accept you, or you will never be invited back again. Both outcomes have their benefits. Definitely an amusing read on cultural differences. While my own experiences didn’t lead to much humor for me, it did lead to one (un)sobering realization. It is true what they say: baijiu does get better the more you drink it, and the expensive stuff really is a lot better than the cheap stuff. I didn’t have any hangovers at all. I myself was in 保定 for New Years. Can’t have been too many more foreign people doing that! Internet makes the world smaller. I hope you accompanied your baijiu with some hearty donkey meat. Oh yes… hearty, greasy donkey meat. One of the things that I miss from living in Baoding are the donkey burgers. Sadly, most people think I’m crazy when I tell them how delicious they were! John, good column, but here’s the thing— whisky tastes great from the first drop. In this globalized era, even the podunkiest town usually has at least 紅牌 , and often much better stuff. 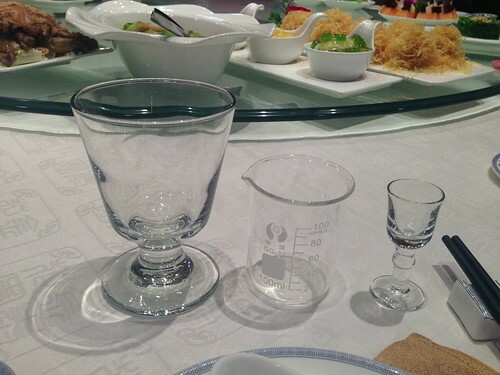 tldr—- the next time baijiu enters my body, it will be playing its proper role, as embalming fluid. So true. You don’t even need a girlfriend to be put to this test. Just go out with any group of guys on any holiday or excuse for a holiday. I live in Baoding, love it, small city small problems. One thing I never do(actually I’ve never done) is drinking, at first family and friends were not so pleased with my posture, pressure only lasted about a month though, later nobody challenged me. I also don’t eat any other meat if it’s not beef or pork, don’t trust them on that since one of my friends told me how they would disguise rat meat with sheep’s fat to make it taste different, heck no! Did you eat 刘家 驴肉火烧吗？ They are the best in 保定。 I remember when they cost 2 kuai a piece and it was 袁家。 There’s also 老驴头 and 好滋味， pretty good. I also once went to a restaurant that served the whole donkey, each piece a different dish. Face good, testicles not so much.